Youtube has become a part of almost every teacher’s repertoire. It is a massive digital library with loads of great stuff. 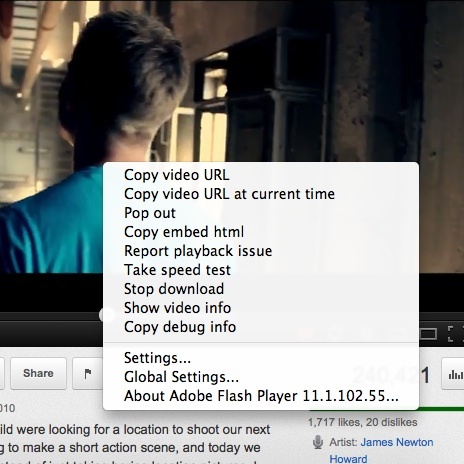 What I want to highlight in a short post is a couple cool little tricks/options when you right click on video. This is perfect for those videos that you want to show at a certain point. You dont want to waste class time watching the first several minutes of a video and you simply want to show a 2 minute clip somewhere in the middle or even at the end. Rather than pausing and waiting for it load so you can find your spot while your kids are getting antsy, simply use the this feature to start your video loading from the exact point you want to show. You then have a couple other options like showing the video info, copying the embed code to place on your blog or website and a handy speed test that will basically evaluate your Youtube download speeds compared to your ISP, region and country. Well, that is it folks. This entry was posted in Video and tagged youtube in school, youtube in the classroom. Bookmark the permalink.